Home Entrepreneur Marketing Mozzy Good Wishes to You & Yours! 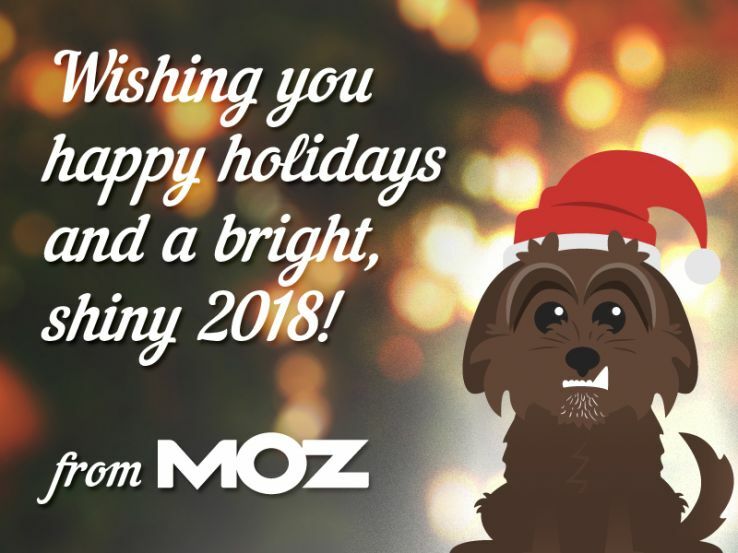 As the long holiday weekend draws to a close and we prepare to welcome a brand-new year, we at Moz just want to thank you all for a wonderful, fulfilling year on the blog. Your colorful commentary, delightful debates, thrilling thumbs-up, and vivacious visits have made the past twelve months sparkle and shine (and with that, I’ll bid the alliteration adieu). Our “card” features a cameo from a little Moz Dog you may recognize: the inimitable Lettie Pickles! At the Moz HQ, we practice a multitude of holiday traditions. Whether it’s Mozzers gathering in the common room (affectionately named “Roger”) to light candles on the menorah during Hanukkah, trading and stealing gifts for the company-wide White Elephant exchange (someone won a bonafide Commodore 64 this year! ), or getting our boogie and our board gaming on at the Moz holiday party, we try to honor this special season with a healthy mix of reverence and good old-fashioned fun. Previous articleAre music lessons the key to smarter kids?